You deserve to play piano by ear … that’s having the ability to listen to any song from an audio track and instantly play it with 100% accuracy. Playing piano by ear also gives you the advantage to write and compose music, improvise and play all those fancy licks and runs as you desire and totally without sheet music. If you resulted to YouTube hoping to find your favorite song.. If you’re frustrated and at the point of giving up. I’ve help thousands. Read this page to learn more about how I can transform your playing and give you the creative edge that the pros used every day. When you’d tap into my expertise you’ll get instant clear precise instruction you can use to gain clarity and understanding. Finally gain knowledge that until now was only shared among privileged musicians. Together we’ll re-purpose your focus and take your playing to the next level. I’ll take all the mystery out of playing piano by ear and simply provide clear methodical teaching based on the principles of music theory that until now were not even taught by music educators. Click the following link and Get Started Today with me. ready to make a bigger impact on your audience, creativity and your overall sound? Whether you’re a pop, gospel, jazz or contemporary Christian musician, the principle of playing piano by ear have always been the same. Sadly most piano teachers only teach what they know. This mostly includes reading sheet music and playing classical repertoire and nothing in between. Why traditional piano method has its benefits, it’s only one dimensional in its approach and won’t teach you to play by ear. The truth of the matter is every piece of classical literature, and every song printed on sheet music was created, written and composed by ear before it was ever transcribed on paper. In other words if great song writers and composers never wrote music on paper the sheet music industry would never exist and traditional piano method would never happen. Imagine a bunch of music students without sheet music. It would be disaster. It you’re taken traditional piano lessons for years and struggle to play jazz, pop, gospel, worship piano and R&B. If you can read music and never discovered how to play by ear. or even get stressed-out if a singer walks out on stage and you’re the only musician in the building and you’re ask you to accompany, but you don’t know the song and the sheet music doesn’t exist. I have students all over the world to prove it. I’m the leading authority in contemporary music education and have taught thousands of students just like you to play piano by ear with prove 100% results. Just enter your first name and email address on the sign up form on the right side of your screen and I’ll see you on the other side. I'm glad you finally discovered my website. Now you want to know more about me and how I can transform your playing and supercharge your ear. I'n the recognized leader in contemporary music education. I've taught thousands of musicians all over the world how to play piano by ear. 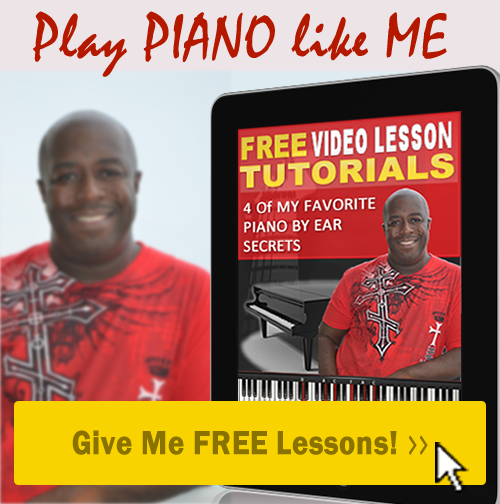 Sign up now and instantly receive 4 on my favorite piano lesson by ear video tutorials. Learn how musicians listen to a music track and nail every chord, lick and run with 100% accuracy.